Vote? Absolutely! … but online? I live in a very progressive community – open government initiatives with lots of opportunities for input, long-term and sustainable vision, alignment with the Canadian Index of Wellbeing – all good stuff. I am also very civic minded. From junior and high school student councils, three House of Commons jobs, work in government relations and community involvement – I’ve always been involved in some capacity and have never missed a vote. I also know that voter turnout in Canada is abysmal, particularly at the municipal level – 34% in my city in 2010 – but as my community introduces online voting, I’m not sure I agree with the approach. Statistics Canada reports that the #1 reason people did not vote in the 2010 federal election is “not interested’ (27.7% of non-voters), followed by “too busy” (22.9%). If that’s the case, doesn’t the challenge lie in helping people understand the issues and the choices rather than making the exercise of democratic rights akin to ordering a pizza or texting “LOL”? 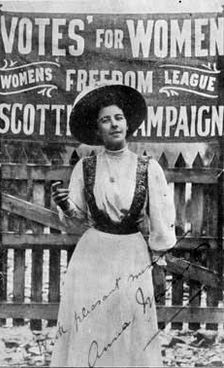 Call me an idealist but online voting makes me think we’re letting down the suffragettes who fought for women’s right to vote. It makes me think of African-American voter registration drives in the 60’s that were met with extreme, and at times, violent resistance. Even recently, President Obama’s 2013 State of the Union highlighted 102-year old Desiline Victor, a Haitian immigrant who waited three hours in line to vote in Florida only to be asked to return later. And what about people all over the world – today – who show amazing bravery by going to the polls? People died in the streets of Cairo for democracy in Egypt… and we can’t walk to the local school gym or church basement? Really? Commitments are most effective when they are active, public, effortful, and viewed as internally motivated (uncoerced) (Influence, 2009, p.95). It’s why people value the outcome of something difficult – like initiations, boot camp, long lines for concert tickets or saving up for something you really want. Cialdini quotes Aronson and Mills (1959) who found “persons who go through a great deal of struggle or pain to attain something tend to value it more highly than persons who attain the same thing with a minimum of effort” (p.78). I’m not suggesting we should deliberately make voting difficult but there should be some effort on our part both because it helps us to value our democratic right and the consistency of behaviour is important for future voter turnout. Let’s face it, voting at any level in Canada is pretty easy. People also need their own compelling reason to vote – their internal motivation – to cement long-lasting commitment. Based on the research, when people feel engaged as voters, they become more engaged as citizens. That’s the piece that addresses the “not interested” or “don’t feel my vote matters” element of StatsCan’s findings. In 2014, the Canadian Index of Wellbeing released its Ontario report which revealed this paradox: More Ontarians are interested in politics, more are registering to vote and more believe it’s their civic duty to vote but fewer are actually voting. Their conclusion suggests “The challenge appears to be how to translate their beliefs and interest into action so that they feel they have a greater stake in the future of our province and country (p.28). So let’s tackle that issue for meaningful participation instead of reducing our civic responsibility. There’s a lot to get excited – or pissed off – about. Start there! Don’t get me wrong. I’m all for maximising the use of technology to debate platforms, share information, spark engagement. But I think it’s important to make an effort to get to the polling place on election day. Agree? Disagree? Tell me why. Share your sources. That’s healthy debate and I’m open to learning. I’m also open to the possibility that online voting is a gateway to deeper civic commitment… but I’m not sold. Talk about and demonstrate the importance of voting and democratic engagement in your family so that people see themselves as “voters” and “citizens” with a stake in the game – because they do.